In this diagram the yellow dot is closer to point A than point B. In fact, any point in the dark blue region is closer to point A than to point B. 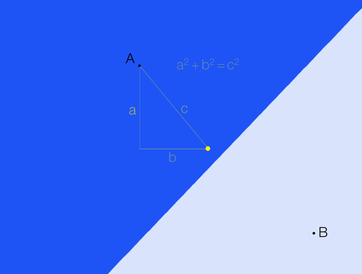 Closer in this case means distance and distance is measured as "Euclidean distance" using the Pythagorean theorem. Another way to think about this is any point in the darker blue region is more similar to A than to B. Similarity is the basis of clustering. What makes two points similar is proximity. Proximity is nearness in place, time, order, occurrence or relation. In this case, proximity is measured in distance.